We are at the Plains Hotel, a magnificent 1910 place restored with a true western feel! Astrid (the owner) greeted us, and told of plans for today. Katrina and Ron did a great job in arranging the details. 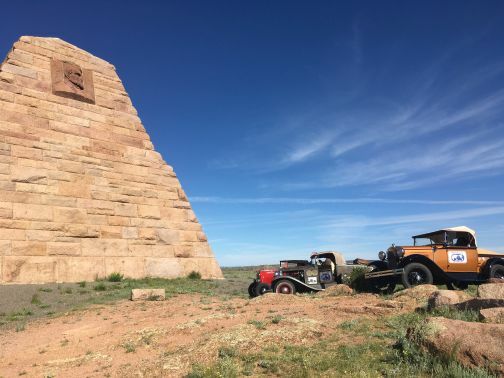 At 8:00 we head for the Ames Monument, which honors the Ames brothers who were largely responsible for building the Union Pacific Railroad. At 10:00 it was Lions Park and “Old Sophie” the 1880’s locomotive that is very similar to the one that passed the Flyer when they used the UP tracks to cross the upper Midwest. 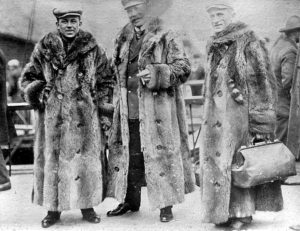 At NOON it was lunch back at the Plains, featuring a 1908 lunch inspired by the original menu that greeted the Flyer crew when they were here March 8, 1908! At 2:00 PM we were off to the Cheyenne airport for pictures in their 1930’s hanger with our cars and a stunning 1942 North American T6 Fighter. Back to the Cheyenne Depot for a tour of the same train station that issued the order making the Thomas Flyer a UP locomotive #274 so they could ride the rail bed west toward San Francisco. At 3:00 we were in the Plaza for a car show, and at 5:00 PM we had a special surprise as Governor Matt Mead of Wyoming joined us! 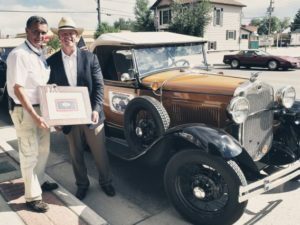 He presented a Wyoming State flag, and has a vintage car of his own! Then we headed for the restored Atlas Theatre where the public was invited for a free showing of “The Great Race” based on the 1908 NY to Paris Race featuring Tony Curtis, Jack Lemmon, Natalie Wood and Peter Falk. Hundreds of pictures were shot, and it will take a few days to catch-up with everything. We will be doing a special entry with several feature photos!